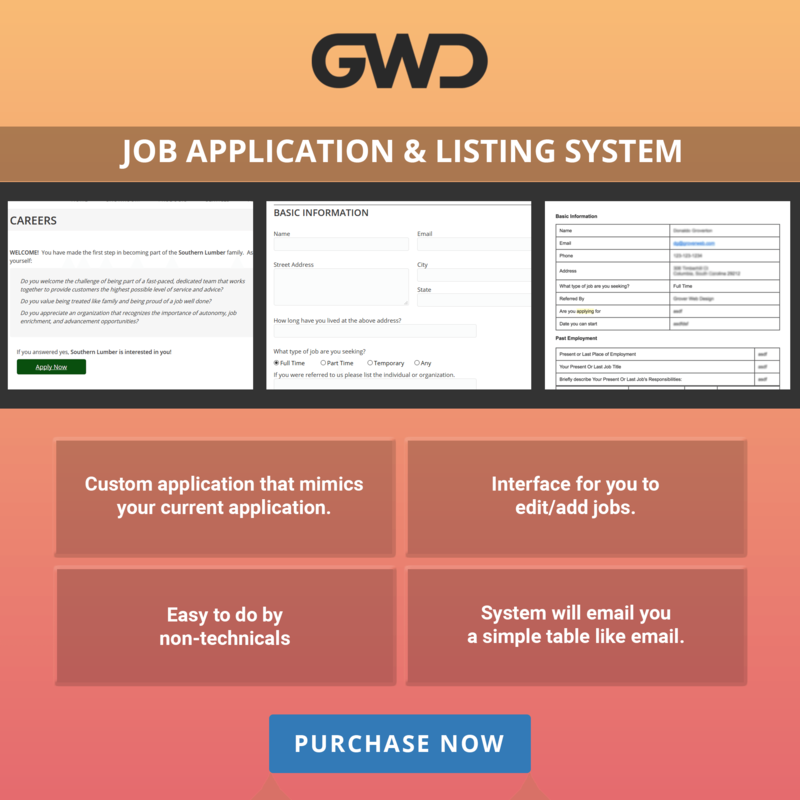 We may just be biased, but we think our Job Application/Listing System is the best one out there. We have had many clients who have the same gripe. It's hard to handle job listings and applications on all of these job sites. Sometimes they want to just have it on their own website and actually have control of things! As with all our software, we built this plug-in in such a way that you will never need us after the initial install. Our goal is to create easy to use software for non-technical employees or business owners. Even if someone does know a bit of coding, there is no need to mess around with HTML if you are just going to change a description on a job listing. We create a custom job application form for each of our clients, which is included in the price. This custom application is very important because it will allow you to get the actual information that you want from a potential employee, not the plethora of meaningless information that is required on big box platforms like Monster. Too much information drowns out the important details that you need to make a good decision! I don’t want to have to call a developer every time I want to edit something on my job listings. My current website the developer keeps telling me that it’s easy and I should be able to do it. It’s not and I don’t have time to learn, I don’t want to be a web developer, I want to run my business… basically, is this REALLY easy for people who don’t know how to code? We made this tool exactly for someone like you. You could figure this all out if you had time to or if you wanted to be a web developer. But, you are focused on your business. Just wanted to post here saying that we use this system and it is great. We really like how easy it is to manage. Our business has high turnover, so we are constantly looking for new people and always have 5+ openings. I manage this myself and I don’t know how to code at all! Glad we have GWD to make things easy. I have experience managing a system like this, our expensive system does not make it this easy. I love how it’s completely web based and easy to use. I’m going to ask my boss to get this system now!